Thank you all so much for all the sweet comments you left on my last post. It’s amazing how just writing it down and getting it out in the world makes it seem like it isn’t such an overwhemling obstacle anymore. So thank you for listening and letting me know that I’m not alone as I felt I was. Thank you. Really. OK, so a few days ago we went to pick up my moms tree because she doesn’t have a car big enough to handle a Christmas tree very well. We stopped by my favorite tree lot after I picked up Creamie from her dance class. It was cold, but I came prepared with boots and gloves and and a hat. I just didn’t come prepared for how adorable she would be flouncing through the rows of trees playing hide and seek. 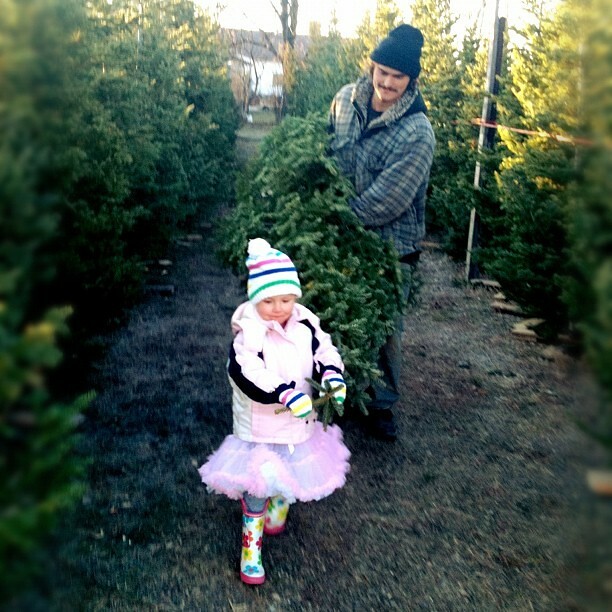 When we found the right tree she very happily offered to help the tree guy carry it to the car. She is so helpful. And I was so thankful that tree guy humored her and let her help him. See, people really are good at heart. Today this arrived, an early Christmas present from my Dad. 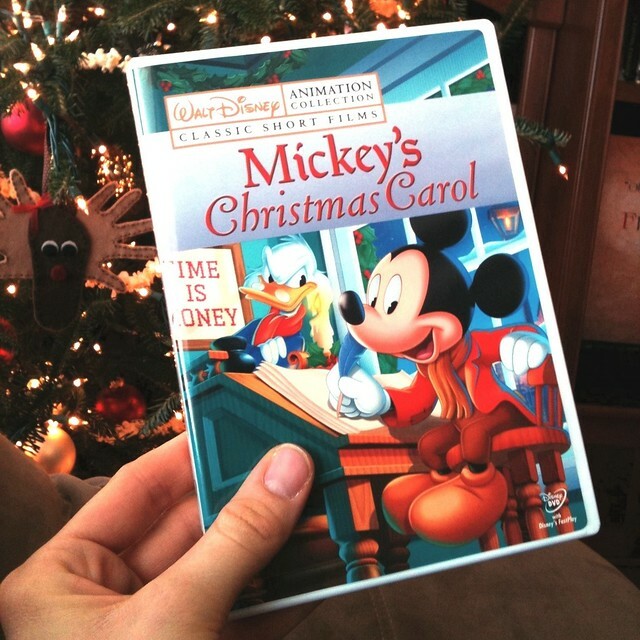 Mickey’s Christmas Carol was one of my favorite Christmas movies growing up. I like it about a million times better than the Muppetts version. It has been a happy afternoon watching this with Creamie. But now I’m off to make dinner. Porkchops with Bean and Butternut Chili and homemade cornbread. Because it’s one of my favorite things ever. 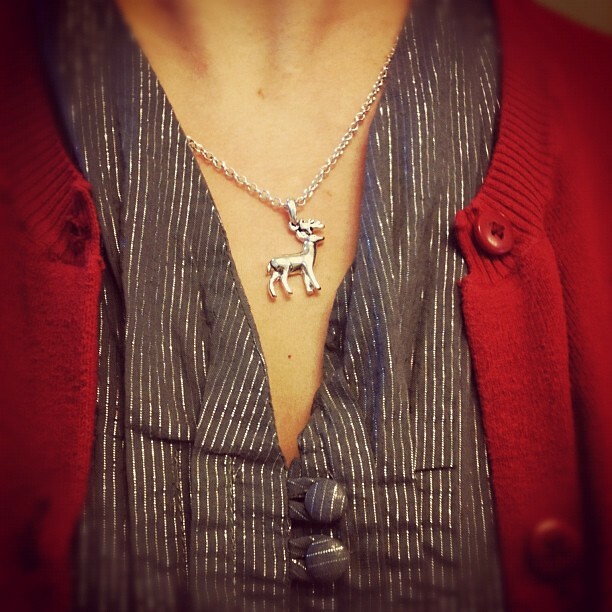 Also, I am really in love with my little reindeer necklace. It was my souvenir from our trip this fall. I found it at a teensy little shop in a teensy little town about 100 miles from the nearest grocery store. But, I did a quick search on etsy for a silver reindeer necklace and there are a few similar ones. It is going to be my new go to holiday item this season I think. That and this silver stripey shirt. I got it free with purchase of a dress last Christmas and yesterday was the first time I’ve worn it. See, I used to be scared of wearing things with stripes… what if no one recognized me? (Which has happened. And it was my sister who didn’t recognize me beacuse I was wearing a striped shirt instead of my standard solid color. Which is a post all by itself. Ha!) Be back soon. And with real photographs. I swear. Also, I did an interview over at MessyLa for her blogiversary, go here to check it out. And I like both versions of a Christmas Carol you mentioned. I do NOT, however, like the Jim Carey weird 3D animated one. So crazy and dark and not sweet. I would not recommend watching it. Mickey’s Christmas Carol is my FAVORITE!! I loved watching that when i was a kid. i might have to borrow it from you sometime. my boys have never seen it but we’ve read ‘a christmas carol’ together and they saw the jim carey version so they know the story. I find that holding things in makes it worse. Whatever it is that is bothering me rattles around in my head and becomes distorted and bigger than it really is. You are a wonderful person and deserve a little magic in your life. I hope there are more Christmas Angels for you this year. Love your pretty stripey shirt and the necklace. Super cute. Oh, and speaking of super cute, that little Cream Puff of yours is so adorable. If you get tired of her, or run out of things to put on your tree, drop her off for an afternoon here and she can help me and my Little Bugs put my tree together. 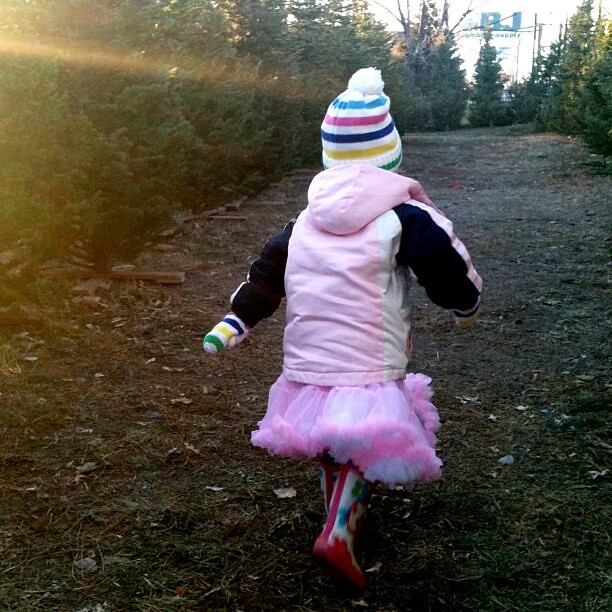 Well, there is nothing better than Christmas tree shopping in a tutu. Except maybe having Johnny Depp working at your local tree lot. Va voom! I mentioned this blog yesterday when I was watching a Muppet Christmas Carol with my sister and her family. She is cute. Even though Christmas passed. But the joy it brought will never gone. Happy New Year. Can I simply say what a aid to find someone who actually knows what theyre speaking about on the internet. You definitely know how one can bring an issue to gentle and make it important. More individuals need to learn this and perceive this aspect of the story. I cant believe youre not more wellliked since you definitely have the gift.